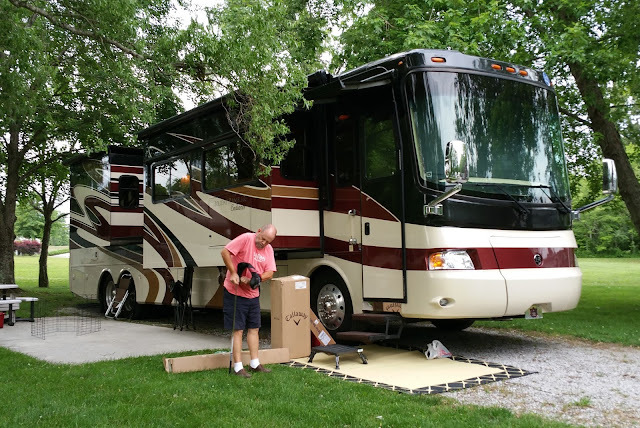 Spring Lake RV Resort, Crossville, Tennessee The inexpensive boxed sets of second hand golf clubs we bought in Florida last February served us well, but as expected, the time came to upgrade. 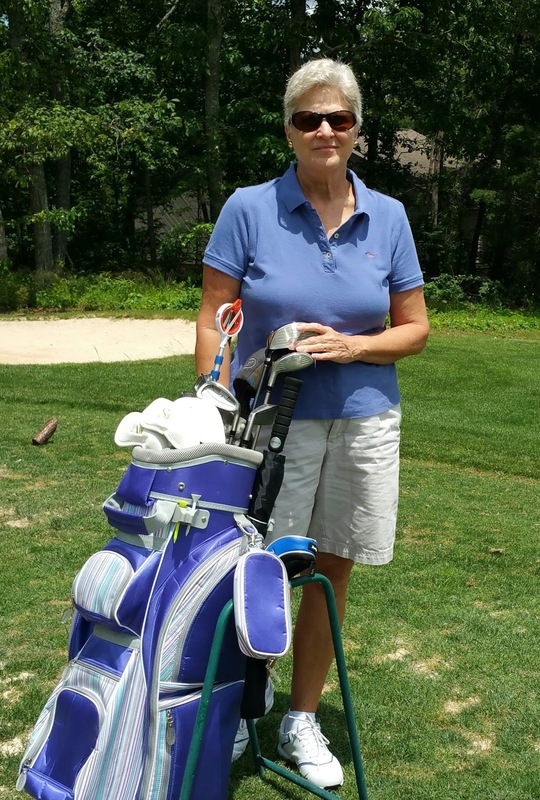 Still new to golf, I could have continued to use mine for a while longer but it served no real purpose to do that and we decided we each would get new clubs. 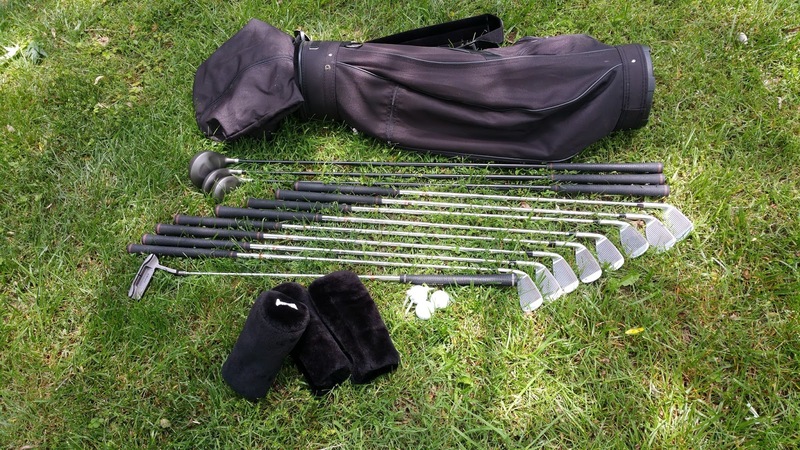 My beginner set of Knight brand golf clubs. Wayne's set is ready for a new home too. 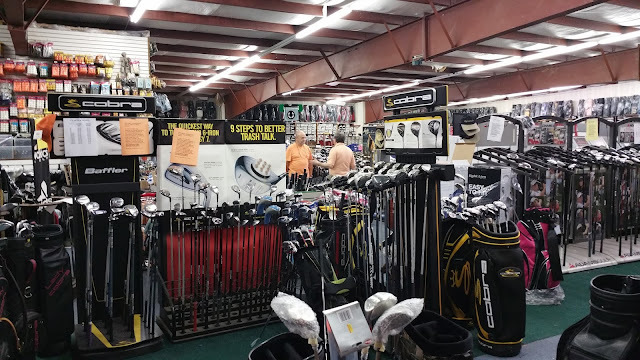 We are still at Spring Lake RV Resort in Crossville, Tennessee where golf is everywhere but beginner golf clubs might be tough to sell. Mostly retirees come here and they are typically well equipped for golf already. Anyway, I advertised our old clubs on Craigslist and within two days, sold both sets to a young man and his girlfriend, from nearby Cookeville, for $25 less than we paid for the combined sets in February. That worked out well enough. Now, though, without any golf clubs, we would be forced to get serious about making a decision on brands, models, price and then the final step of making the purchases. Being hardest to please, we concentrated on Wayne first. We did our homework about golf clubs for seniors and began researching the brands and models that we felt best suited for us.We both settled on the idea of graphite clubs. 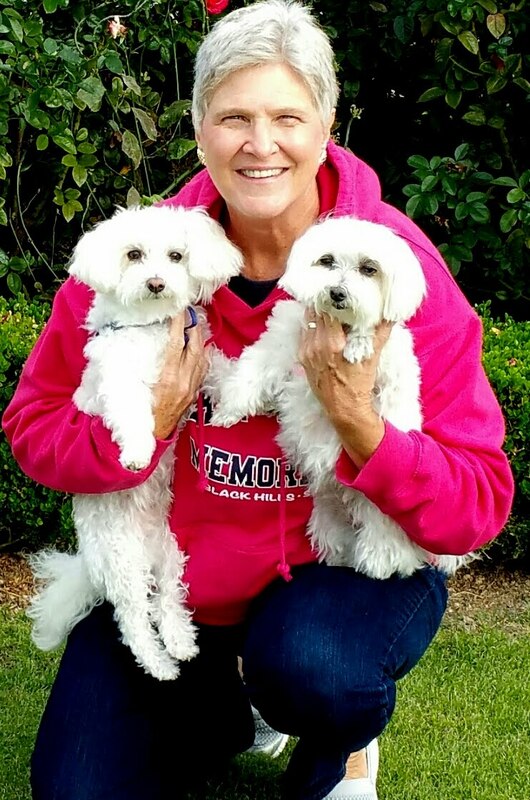 Ladies for me -- seniors for him. 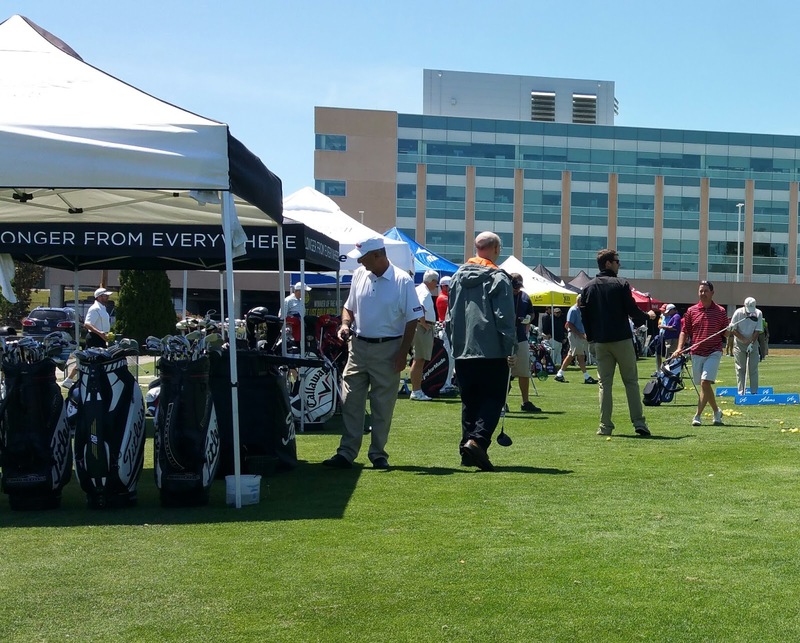 While golf courses are plentiful in this area, golf equipment retailers aren't. The nearby pro shops had only a few sets, very limited brands and we couldn't get enough personalized attention to get serious about buying from them. 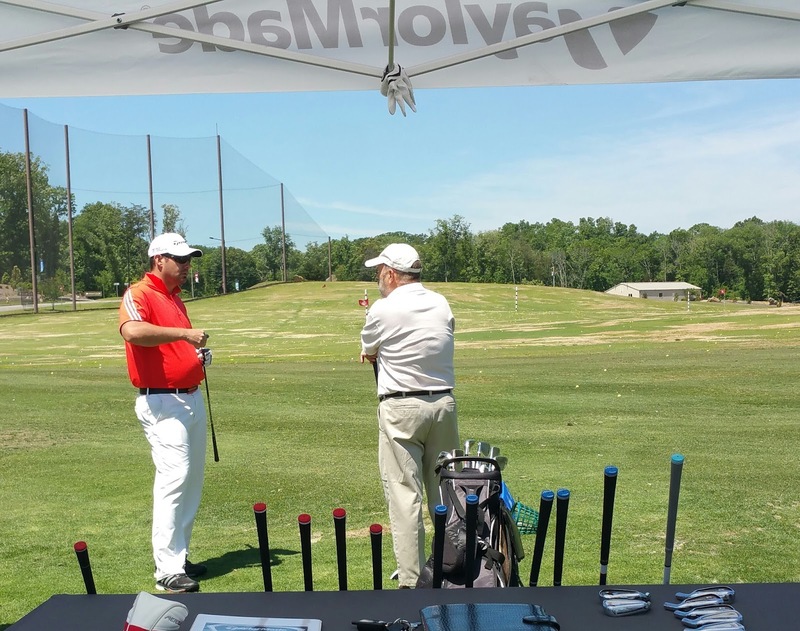 We knew we needed to be properly fitted and we wanted plenty of practice swings to make a decision and that would take someone to take an interest. 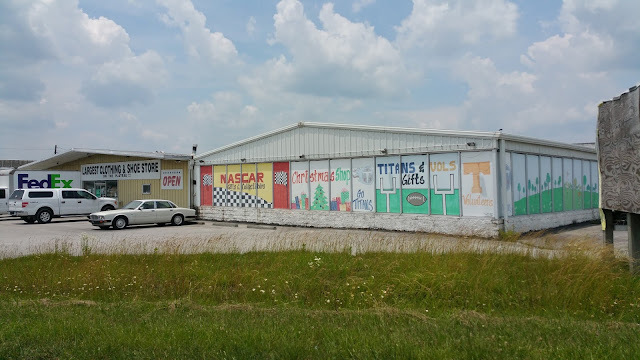 Our golf club search moved on to Knoxville, about 60 miles east of Crossville, where we found an Edwin Watts retail store and a more motivated sales staff. 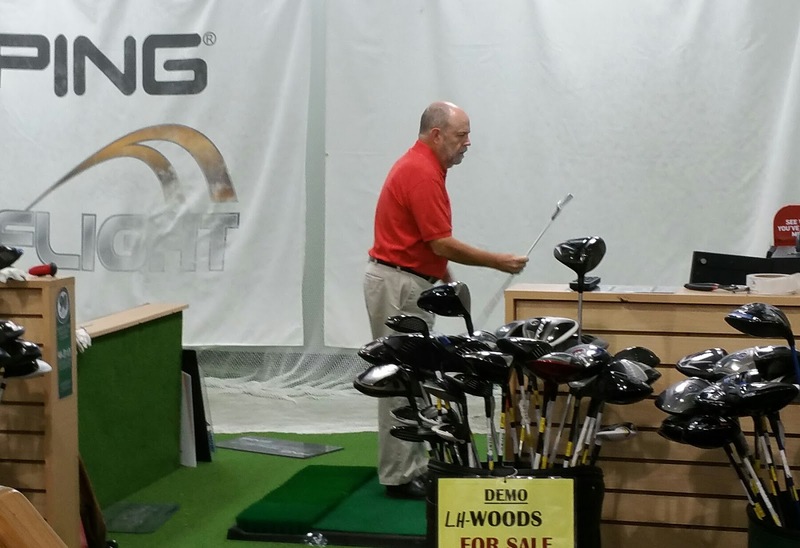 Wayne was measured, fitted and hit hundreds of balls with a variety of clubs. We attended a manufacturers' demo day too where Wayne continued to hit balls with senior graphite clubs by Adams, Mizuno, Taylor Made, Ping, Callaway, Wilson, Cobra, Titleist and Nike to name a few. He was exhausted but formed some important ideas about what felt best . He had also made progress in correcting the terrible hook developed last winter. He's at the Adams display in this picture. This is probably a good place to insert an important fact. 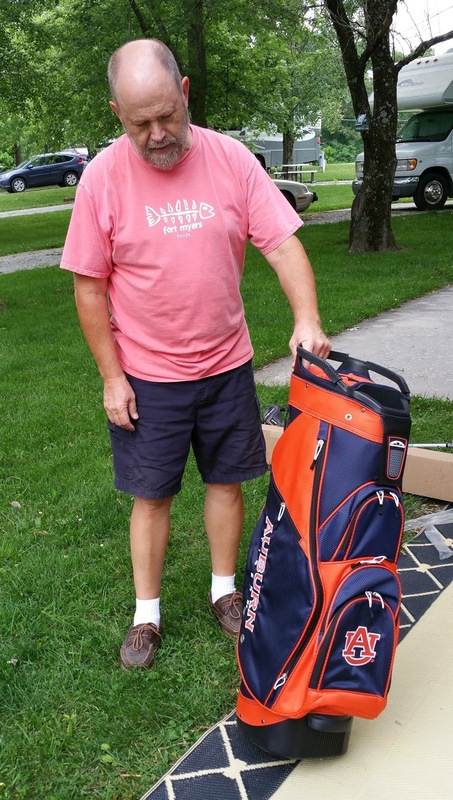 While Wayne grew up playing golf and played for many years, he has never picked out a set of clubs for himself. Because his father was such an avid and good golfer, Wayne always was supplied with quality clubs handed down from his dad. He is especially excited and careful about the experience of actually making the selection of his clubs and accessories this time. Talking... and listening... to everyone. At last Wayne's selection was made with the help of a nice discount from the manufacturers Demo Day. He selected and brought home his new irons and driver. 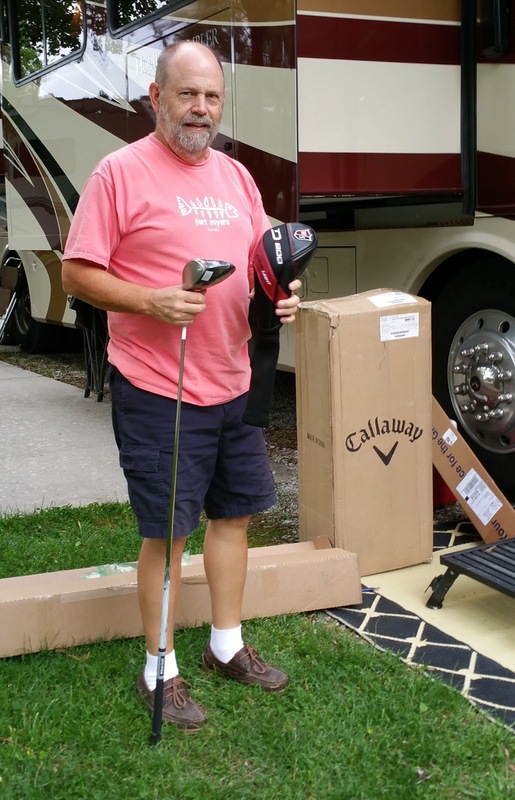 He ordered his bag and fairway wood for shipment directly to the campground. At home that evening, we ordered Auburn head covers, towels, umbrella and golf glove. The next week was like Christmas and he was like a little boy. Big boy with new toys. Here's the new fairway wood. Opening all the boxes - one at a time. 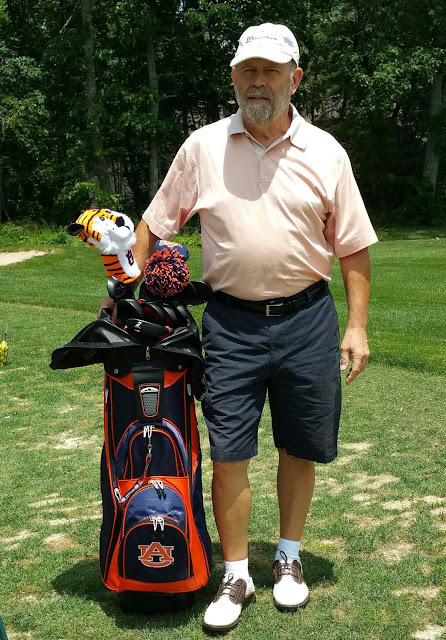 Last but not least... the Auburn golf bag. With Wayne's golf club purchase out of the way, I could then concentrate on buying mine. I looked at complete sets online and in stores and didn't care for what I found. I like using irons and dislike hybrids but most sets came with few irons and plenty of hybrids. Other complications, like white bags and too few of the clubs I wanted added to my frustration. Then during an online search for golf equipment, I came upon U.S. Golf and Tennis on Genesis Road right here in Crossville. I couldn't find a website for the company and they didn't have a presence on Facebook. I did find one customer review and it was unflattering but we became curious nevertheless. Anyone who knows Wayne and me know that we love shopping. 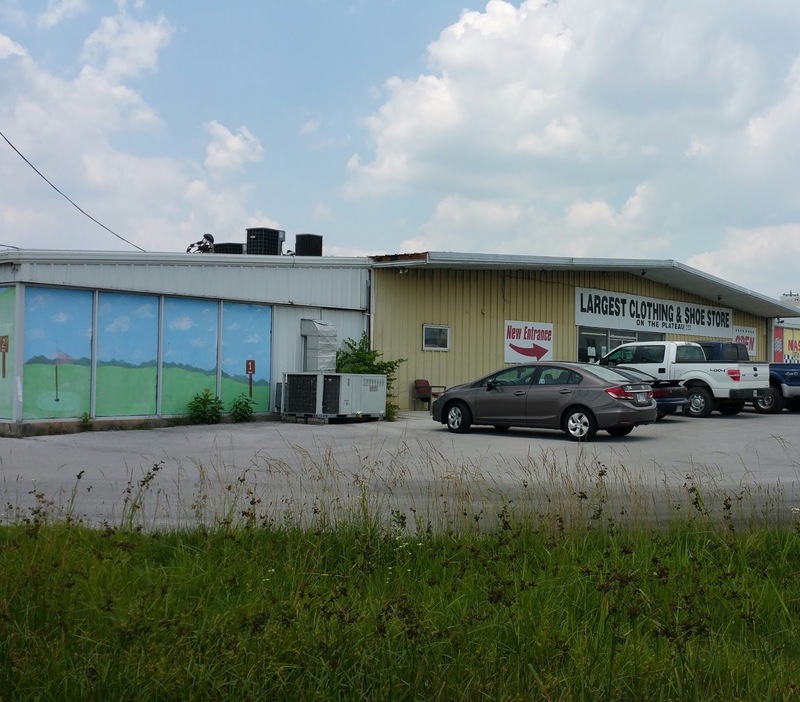 The single negative review concentrated on the store's clutter and unkempt appearance which doesn't bother us. Sounded intriguing. We made a plan to stop in the next day. A building with an addition, and another and another and another. The place is huge and completely full of merchandise. U.S. Golf and Tennis is about a half mile off I-40 on Genesis Road near Crossville's Outlet Center. Lexie and Ozzie were in the car with us the first time we stopped. Wayne went in to look around while I sat in the car with the dogs. Pets are not allowed inside. Some 30 to 35 minutes later, when Wayne had not emerged from the sprawling building, I went in to look for him. I was warmly greeted by the lady behind the counter and then overwhelmed by the content of this store. Wow. Stuff was everywhere. Displays, boxes, racks, signs, stacks and heaps of merchandise. Golf merchandise mostly, with a little tennis stuff too. Oh, I knew Wayne was somewhere deep within these walls having a shoppers field day. U.S. Golf and Tennis from the other side. In a far distant corner of another section of the store Wayne was buried among the golf clubs, accessories, shoes and bags. He introduced me to Arthur, owner of U.S. Golf and Tennis, a pleasant man who welcomed our browsing, offered advise when needed and answered questions when we had them. 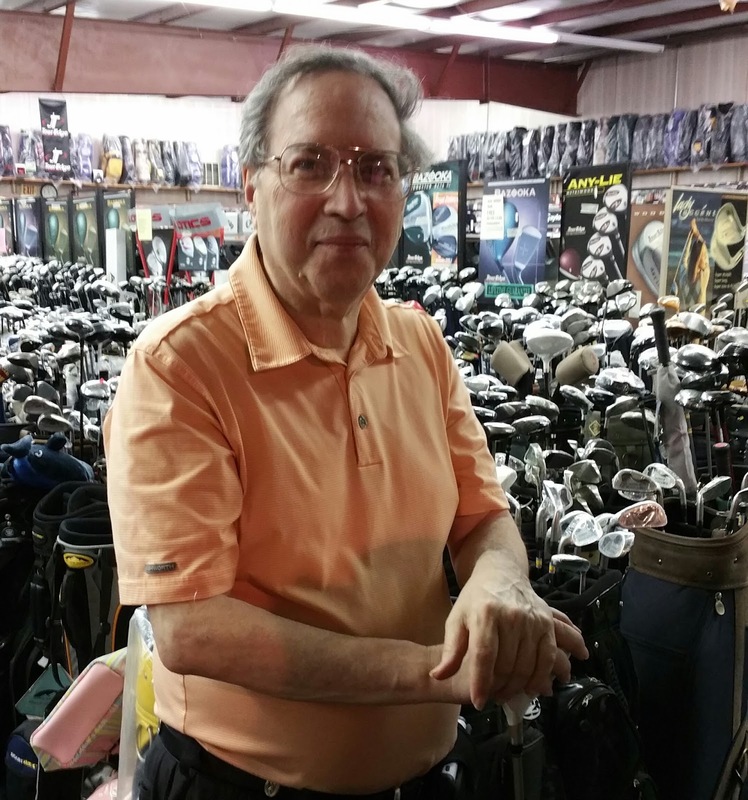 Arthur amid the thousands of golf clubs and bags in his store. He has a serious look but actually has a very good sense of humor. It was needed to outfit me with golf clubs. 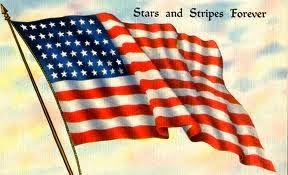 Wayne and I would return time and time again to U.S. Golf and Tennis before we actually even made a purchase. Hours flew by like minutes. Ladies Eastland golf shoes were on sale for $20 a pair -- and there were literally hundreds of pairs. Other brands were discounted 50%. I tried on shoes, I shuffled boxes, I rested when I got tired and washed my hands when they got dirty from box shuffling. What a shopping thrill this turned out to be for us. We had to learn to lace kilties. 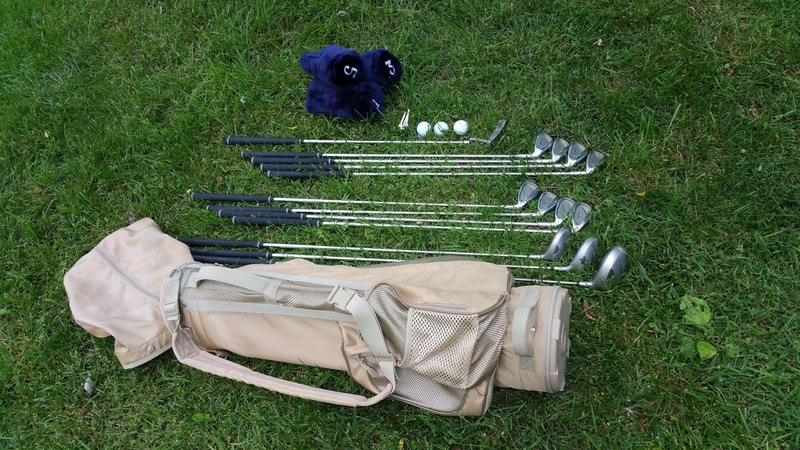 My clubs, bag and all my golf accessories would be purchased from U.S. Golf and Tennis. We met Arthur's wife, Louise, who I came to like so very much. Their story of getting to this point in the business was ever so fascinating. We learned that U.S. Golf and Tennis supplies many of the local pro shops too. 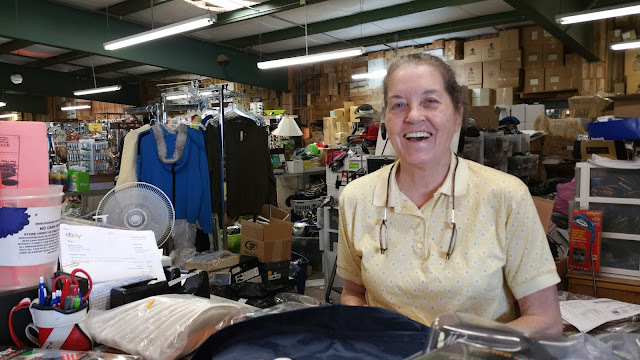 Arthur's wife, Louise behind the counter at U.S. Golf and Tennis in Crossville. Louise and Arthur know what's in all the boxes and all the bins in all the rooms in every section of this store. My golf equipment would, in the end, consist of a full set of name brand ladies graphite clubs, driver, fairway wood, bag, head covers (including iron covers), towels, gloves and more for about half of the cost of Wayne's set even with the manufacturers discount. 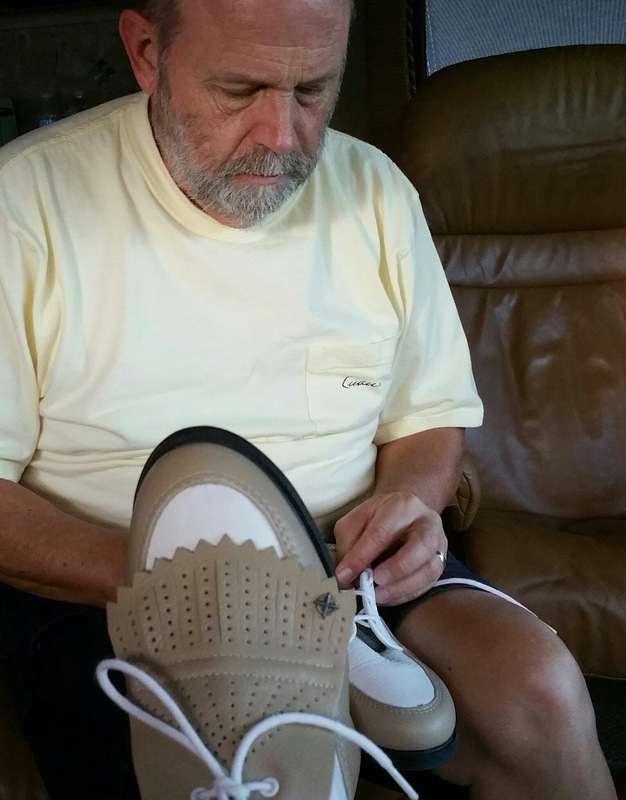 Wayne found himself a beautiful new pair of Nike golf shoes and we loaded ourselves with miscellaneous other golf merchandise. In the center of the picture, hard to see, there's Wayne and Arthur. 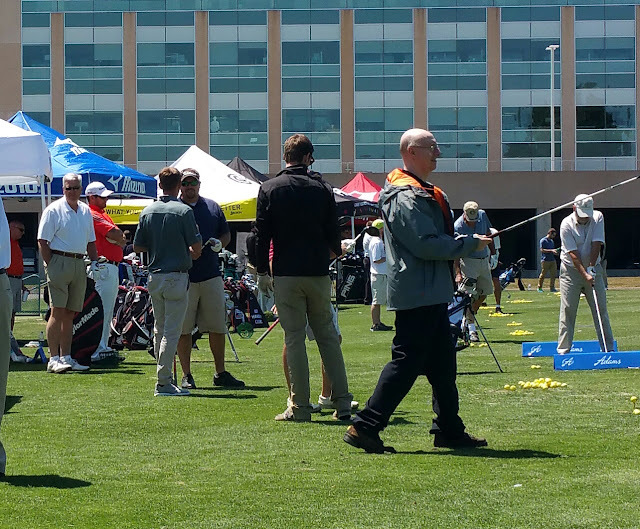 New golf bags (in plastic) line the perimeter of this section of the building. 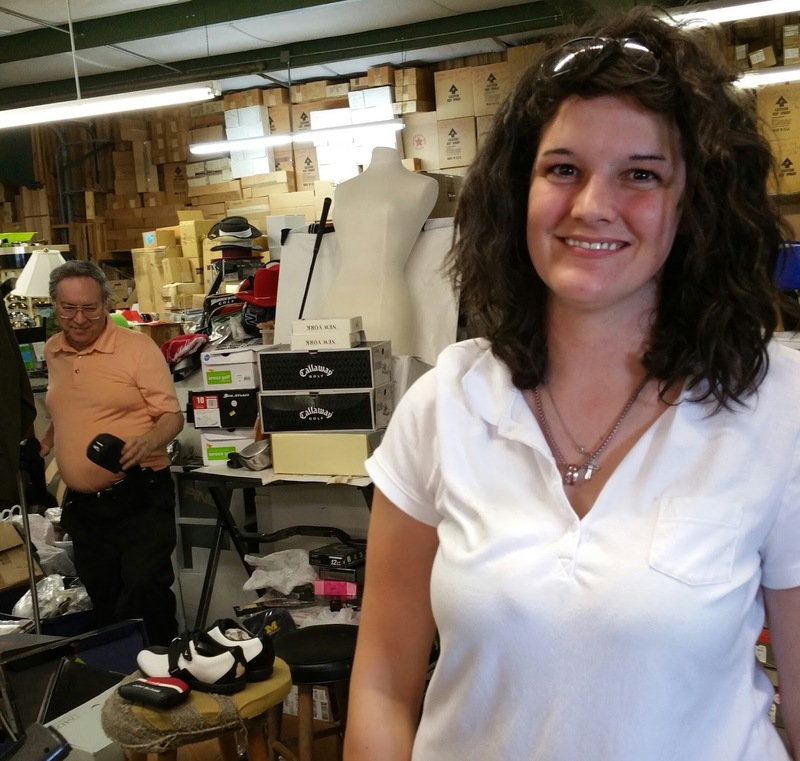 The icing on the cake of my golf club buying experience was the sweet young lady in the photo below. Tiffany manages counter sales and has, quite simply, a wonderful attitude and customer service skills that any business owner would envy. 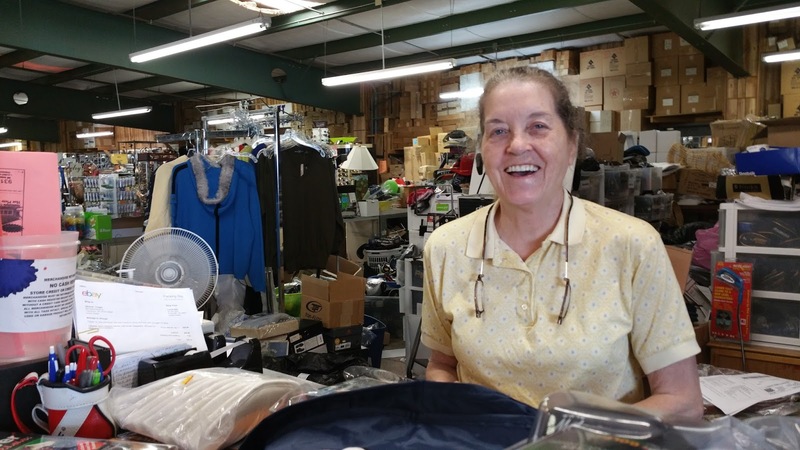 She worked tirelessly in the store and welcomed every customer with a smile while we were there. Saved the best for last -- Tiffany. As often and as long as we visited U.S. Golf and Tennis, we occasionally found ourselves famished at lunchtime. 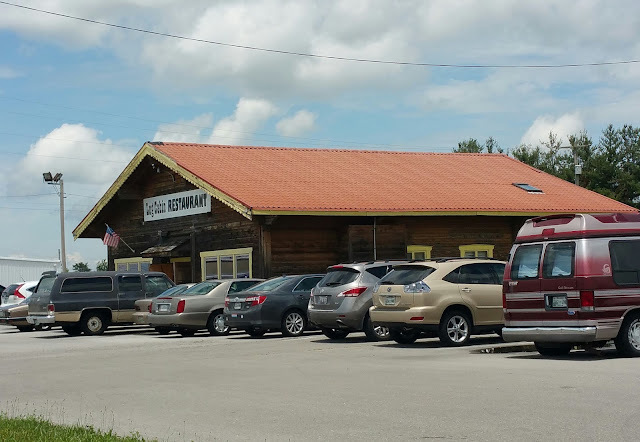 When that happened, we enjoyed lunch at the Log Cabin Restaurant just around the corner. Enjoy your stay in TN and I hope it's been a little cooler on the plateau than down here in the valley. When I moved to TN in the late 60's there wasn't much in the Crossville area, then Fairfield Glade came along and the area has turned into a Tennessee golf Mecca.